Two weeks ago I welcomed the Class of 2016 to the Chicago-Kent community. I am pleased to report that this class of 1Ls is a truly diverse and accomplished group. They hail from 12 different countries, 125 different undergraduate institutions, and speak 24 different languages. In terms of experience, the Class of 2016 counts among its ranks a commodities trader, a music video director, a gourmet chef, a U.S. Naval Commander, and twenty-nine holders of advanced degrees. I believe that you'll be hearing great things from the Class of 2016. 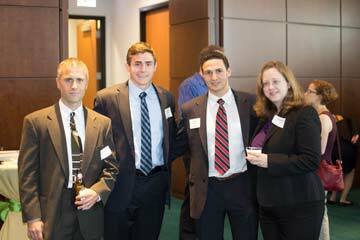 Alumni support plays a critical role in the success of our current and future students at Chicago-Kent. In February, we launched the Fueling Innovation campaign with IIT, and 2,364 alumni have contributed more than $5 million to the campaign thus far. Thanks to the generous support of our alumni donors, we have been hard at work implementing the structural and curriculum changes necessary to keep Chicago-Kent on the cutting edge of legal education. Thanks to generous alumni support, we have been able to increase the number of students receiving donor-funded scholarships by almost 20% as well as adding the Entrepreneurial Law Clinic to our clinical program offerings, providing students with the tools and expertise necessary to counsel emerging companies. We have also made significant improvements to infrastructure including opening the Bruce M. Kohen Courtroom, a high tech, true to life space, built to provide practice and competition space for our top-ranked advocacy teams. This year we have honored our 125-year legacy of distinctive legal education. The generous support of our alumni community will ensure that legacy continues for generations to come. 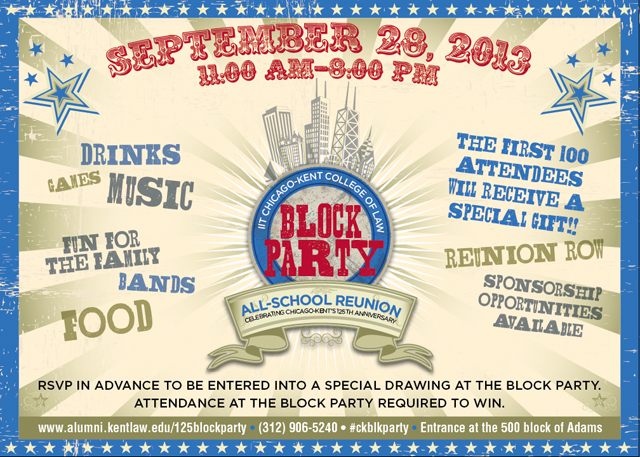 Be sure to join me at the 125th Anniversary Block Party & All School Reunion on September 28th to reminisce with your classmates, meet the next generation of Chicago-Kent alumni and see some of our programs in action. Illinois Solicitor General Michael Scodro has enthusiastically agreed to serve as ISCOTUS' inaugural Appellate Lawyer in Residence. This fall, Chicago-Kent students will be able to observe Scodro as he prepares for his oral argument before the United States Supreme Court in Levin v. Madigan, the first case that will be heard in this upcoming term. IIT-Chicago Kent College of Law will host a delegation of distinguished guests of the Irish bench and bar the week of September 9th, 2013 to celebrate the new academic exchange between Chicago-Kent and the Bar Council of Ireland. The guests will include Mr. Justice Frank Clarke of the Irish Supreme Court, Chairman of the Bar of Ireland, Mr. David Nolan, Vice-Chairman of the Bar of Ireland, Mr. David Barniville, President of Arbitration Ireland (and former Bar Chairman) Mr. Michael Collins, and barristers Mr. Shane Costelloe and Mr. Jarlath Ryan. The guests will give a guest lecture at Chicago-Kent and participate in a luncheon and panel discussion. The Irish American Law Students Association will host the delegation for a traditional "Dining In" event in their honor. The Chicago-Kent Alumni Board of Directors represents the Chicago-Kent alumni community by overseeing and supporting various programs and events. The Board is dedicated to strengthening bonds between the law school and its students and graduates and serves as a voice for the Chicago-Kent alumni community. 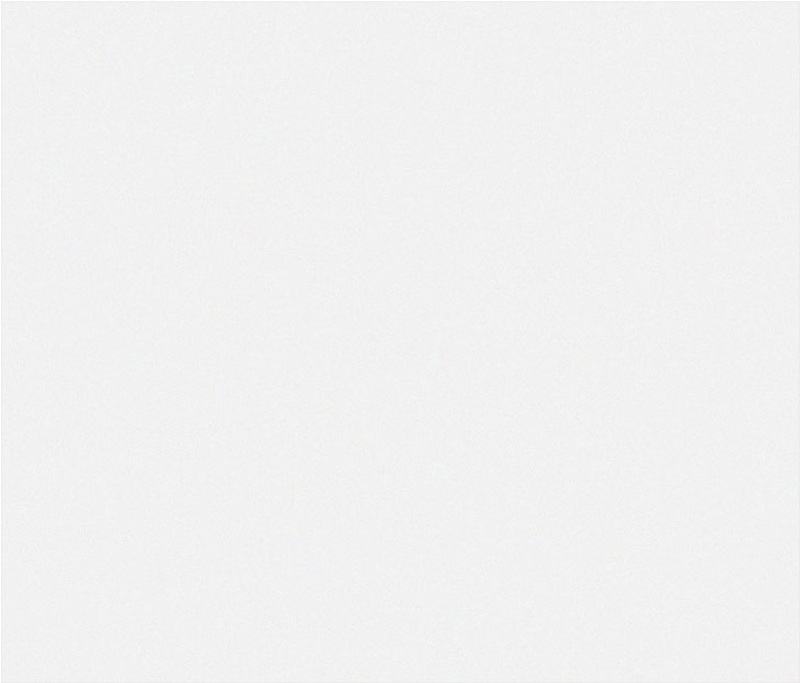 You can find the full list of board members here. Are you a Chicago-Kent graduate from the past ten years whose looking for a way to stay connected to the school, network with your fellow alumni and develop leadership skills? 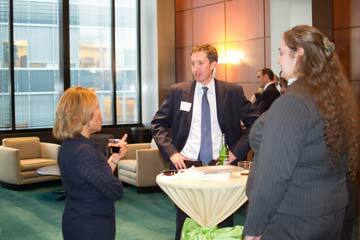 Consider joining the Chicago-Kent Young Alumni Council. The Council aims to bring alumni from the last 10 years together through several social events and a Spring CLE & Networking Series, and is currently seeking new members. For more information about joining the Chicago-Kent Young Alumni Council, please email Katie Aune, Director of Alumni Engagement, at kaune@kentlaw.iit.edu. Race Judicata is September 12, and Chicago-Kent has a team. The Chicago-Kent Sportfeasors has once again reserved a tent for those who sign up with their team. All alumni are eligible and the Sportfeasors will provide food and drinks both before and after the race. Register here and be sure to select Chicago-Kent Sportfeasors as your team. Email sportfeasors@kentlaw.iit.edu for more information and to receive team communications. The Council on Legal Education Opportunity recently named IIT Chicago-Kent College of Law to its "45 for 45" list of law schools, firms, corporations and individuals that have displayed outstanding commitment to promoting diversity in the legal profession. IIT Chicago-Kent will be formally honored at a reception in Washington D.C. on Thursday, September 26. On Thursday, September 26, Chicago-Kent will host Lagunitas Brewery Founder Tony Magee for a Fireside Chat to discuss the challenges he faced building and running a successful start-up and what it takes to sustain the health of the fastest growing brewery in the U.S. Mark Bazar, host of the Interview show, will facilitate the discussion, which includes an hour-long Q&A session featuring questions directly from the audience. Attendees will also enjoy hors d'oeuvres and a Lagunitas beer tasting. Register Now. Chicago-Kent will host its 125th Anniversary Block Party on Saturday, September 28 from 11 a.m. to 8 p.m. at the intersection of Adams and Jefferson streets. There's truly something for everyone happening at the Block Party. Are you a craft brew or cocktail connoisseur? Enjoy samples of your favorite Lagunitas beers provided by Tony Magee and Carissa Brader '91 as well as Cane & Abe Rum tastings provided by Old Sugar Distillery. Foodies can nibble to their heart's content on delicious food offerings from Par Bar & Grille, courtesy of Marc Smith and Mary Nicolau Smith '85, Giordano's Pizza courtesy of Richard Levy '97, Taco Burrito King, Al's Beef, Pazzo's, Callihan Catering and of course, the Spak cafeteria! Music lovers can treat their ear drums to the musical stylings of Chicago-Kent's talented alumni bands on our main stage. Tony Magee will give a musical performance as well as John Locallo '86, Carlos Vera '12 and their band "5-thirty," Ed Harris '01, DJ Bart Lazar '87, and Clandestine featuring Tim Culbertson '95. The festivities will also include a "Reunion Row" for classes celebrating a reunion, special recognition for couples who met and married at Chicago-Kent, kid-friendly booths and games and tours of the 565 W Adams building. Register Now to be eligible for prizes to be given away at the Block Party. Interested in sponsoring the Block Party? Email alums@kentlaw.iit.edu for more information. Christopher Williams ’04 is the founder of Working Hands Legal Clinic and Workers’ Law Office, PC. Since graduating nearly a decade ago, Chris has focused on collaborating with a network of community-based centers to support workplace justice campaigns, policy reform, and access to legal services for low-wage workers. He was recently nominated by the Governor of Illinois to serve on the labor advisory board of the Illinois Department of Labor. 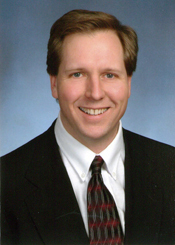 This year, Chicago-Kent welcomes Chris into its Senior Partner Council. His status as a recent alumnus with a public interest background makes him unique among donors in the Senior Partner Council. Irish American Law Student Association Presents "A Dining In"
Wednesday, September 11, 2013 | 6:30 p.m.
"Money, Privacy, Power and the Law"
Tuesday, September 10, 2013 | 1:00 p.m.-6:00 p.m.
"A Brief Overview of the Irish Legal System and Advocacy in Ireland"
Guest Lecture featuring members of the Supreme Court of Ireland, the Irish Bar and Arbitration Ireland. Wednesday, September 11, 2013 | 1:00 p.m.-3:00 p.m. Arbitration in Ireland and the U.S.
Tuesday, October 22, 2013 | 12:00 p.m. - 1:00 p.m.
IIT Chicago-Kent Law Review Alumni Board hosted its second annual Student Alumni Networking Reception on August 8 at Chicago-Kent. More than 30 alumni attended the event, and both current students and alumni enjoyed the chance to network with each other before on-campus interviewing began in mid-August.